A five day workshop on 'Information Literacy Skills' for public Librarians of Ampara district was successfully conducted by the library, South Eastern University of Sri Lanka (SEUSL) in collaboration with Local Government, Eastern Province from 16th to 20th April, 2018. The first two days of the workshop was held at Karaitivu Public Library and the rest three days at the Library and Staff Development Centre of the SEUSL. Librarians and Library Assistants of twenty public libraries participated and benefitted from this practical oriented training program. This program was inaugurated on Monday 16th of April with Prof. M.M.M.Najim, Vice Chancellor, SEUSL as a Chief Guest, and Mr. A.T.M. Raafi, Assistant Commisioner of Local Government, Ampara Regional Office, Eastern Province as Guest of Honour and Mr. K. Jayasiri, Chairman Predeshya Saba Karaitivu as special Guest. While addressing the inaugural session Prof. M.M.M.Najim, Vice-Chancellor, SEUSL indicated that library, SEUSL has conducted several outreach activities and this is also one of such programme. And Community development is one of the strategic activities of their university and they have planned to conduct more in future. He also mentioned that it is essential to create the society as knowledge society and the role of public libraries is very important for this purpose. He requested the public librarians to close the mismatch between the collections and the user demands. Mr. A.T.M. Raafi, Assistant Commissioner of Local Government, Ampara district says this is very important workshop and information literacy is essential to create graduates, too to develop critical thinking skills. Also he requested the university to motivate undergraduates or post graduate students to do some researches to evaluate the impact of some projects and activities carried out by local government and they would like to collaborate more activities and projects in future. Acting Librarian Mrs. M.M.Mashroofa stated that this type of workshop is very essential to develop the future generation as lifelong learners and the public libraries of this region should train their library users to become information literate individuals. Public Libraries should be dynamic in nature in developing general public. Information Literacy skills including organizing knowledge, library management, analytical and location skills, mind map and concept maps, print and electronic resources, efficient and effective information search, retrieval, evaluating print and electronic resources, how to properly guide library users and plagiarism and fair use of information were the topics learnt at the workshop. Mr. P.G. Premadasa Senior Lecturer of National Institute of Library and Information Science (NILIS), University of Colombo, took part as a main resource person for the workshop. Mr. Sulaimalebbe Mohamed Sajeer, Assistant Librarian coordinated the workshop and the library academics of SEUSL Mrs. M.M.Mashroofa, Mr. M.C.M. Azwer. Mr. A.M.Nahfees, Mr. SLM. Sajeer and Mr. Eranga Sanjaya Bandara took part as resource persons and co-facilitators. Feedback of the participants is highly satisfactory and this motivated the resource persons to do more in future. Mr. P.G. 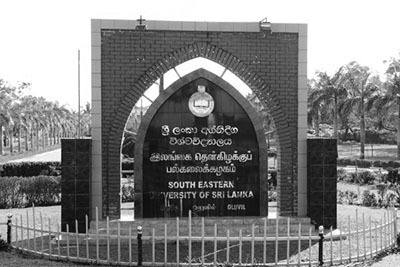 Premadasa, Senior Lecturer, NILIS, University Colombo, the main resource person has guided to formulate a three month strategic plan for the libraries and Library, SEUSL will do the follow up activities.